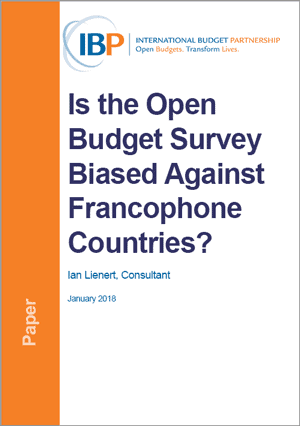 Is the Open Budget Survey Biased Against Francophone Countries? The trends in budget transparency as measured by the Open Budget Index in francophone countries through the OBS 2015. The main factors contributing to the level of fiscal transparency. The specific features of francophone countries that may, or may not, contribute to bias in OBS results.